This is a hearty, dark red wine made from the Carmenère grape variety. It's aged in oak for a short period to give it just a little spice on the palate. An excellent choice for meat and barbecue. Somehow I've never been a huge fan of Carménère. Nor have I been able to accept it as a special grape producing high-end wine. But, I have to say this wine has happily made me take another look at the much ballyhooed Chilean specialty. Not only is it just plain delicious for everyday drinking at an amazing price but it also offers beautiful complexity, silky tannins, and thirst-quenching acidity! Notes of smoked paprika, juicy red fruits, fresh ground black pepper and a whisper of vanilla. An exceptional wine for the price with balance and elegance! Hundreds of years ago, the red Carmenère grape was widely used in the blended wines of the best châteaux in Bordeaux. No more, however: it was difficult to grow and often gave low yields, so the French mostly abandoned it. It has recently found a home in Chile, where it has successfully been made into full-bodied, deep red varietals. 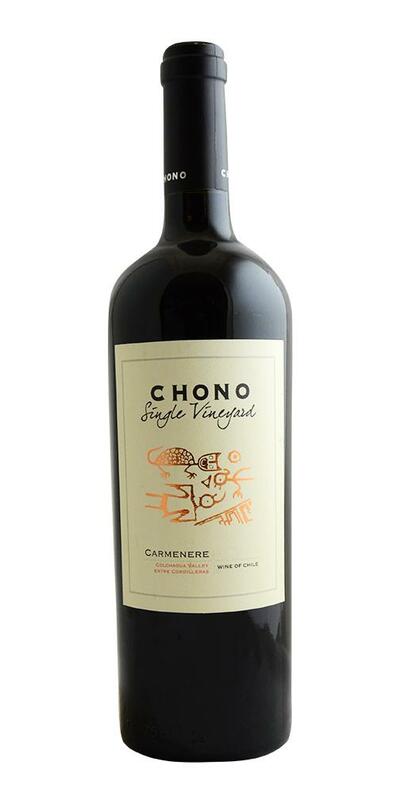 Notify me when Chono "Single Vineyard" Carmenère - 2017 is back in stock.